Gordon got up with the sun every morning and went to find mushrooms. He took a brown bag to put them in. Brown didn’t show up the dirt too much. One morning, early in the fall, he went out as usual. He walked up the hill, through the glen, into the woodlands, and crossed the meadow. “Where are all the mushrooms?” Gordon couldn’t see one of them anywhere. He splashed through the stream, ran into the pine forests and walked into the lowest valleys, but he still didn’t find one mushroom. Gordon didn’t know what to do. He sat down on a hollow log and cried. “I have to find some mushrooms. Oh what shall I do?” He wiped his tears away with his shirt sleeve. “Why do you need mushrooms?” The snail inched its way closer. “To make stew. Stew is no good without mushrooms,” Gordon complained. “He can’t find any mushrooms,” the snail answered. “Gordon, why do you need mushrooms?” The butterfly fluttered around him. “To make stew. I can’t make stew without mushrooms,” Gordon sobbed. Gordon looked up. “Are you a witch?” He saw a woman in a green dress with a red apron and tall pointed hat. “No, silly boy. They are at my house in the forest. If you come with me, I’ll show you where you can find some,” Fiona said. “Silly snail. I don’t do things like that. Come with me, Gordon.” She led him deep into the forest. Growing all around her house were fat mushrooms. “Wow! Look at all these. Can I pick them?” Gordon smiled. “Are you going to turn me into a toad?” Gordon shook. “No. The favor I ask is that you cook a big pot of stew for me. Will you do that?” Fiona waited for his answer. “I will. Can I cook it at your house and use these mushrooms?” Gordon laughed. “Yes,” Fiona said. That night Fiona and Gordon feasted on stew and hot bread from her oven. The butterfly arrived in time to lick the bowls clean. The snail even came by, happy to see that Gordon hadn’t been turned into a frog. 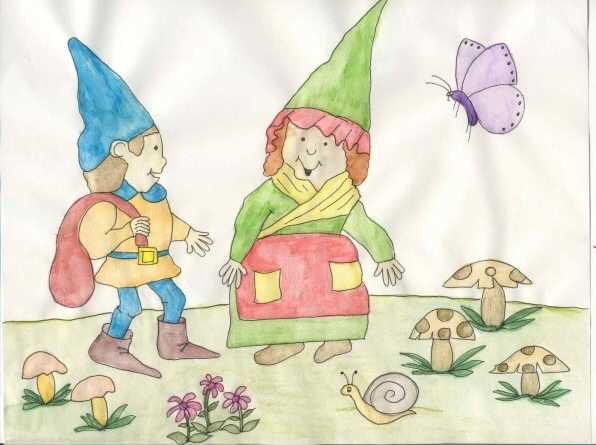 From then on, Fiona only picked some of the mushrooms and left the others for Gordon. Once a week he went to her house in the forest and cooked her a pot of stew.